Home / News / Politics / Robredo's message to Imelda Marcos: "Hindi dahil lampas 70 ka na, hindi ka makukulong. Nagagawa mo pa nga mag-party e."
Robredo's message to Imelda Marcos: "Hindi dahil lampas 70 ka na, hindi ka makukulong. Nagagawa mo pa nga mag-party e."
Vice President Leni Robredo made a remark on former first lady and current Ilocos Norte Representative Imelda Marcos who was convicted of seven counts of grafts last Friday. Robredo said during an interview with RMN on Sunday, Imelda's conviction is a proof that there are a lot of criminal cases that happened during the Marcos regime that is now being exposed because of the conviction of Mrs. Marcos have to face. "Patunay lang naman ito na, unang una, marami talagang krimen na naganap noong panahon ng rehimeng Marcos," Robredo said. Marcos' graft cases stemmed from complaints filed in 1991 when prosecutors alleged that the Marcos family channeled public funds into their personal accounts overseas. With her conviction, Marcos is sentenced to imprisonment of 6 years and 1 month to 11 years for each of the 7 counts, with perpetual disqualification from public office. The court gave Marcos and her counsel 30 days to explain their absence during the promulgation. Hours after Sandiganbayan 5th Division found her guilty in 7 counts of graft for using her Cabinet position to maintain Swiss bank accounts, photos of Marcos and other politicians were seen to celebrate Imee's birthday celebration on the same day that the Sandiganbayan's promulgation was released. 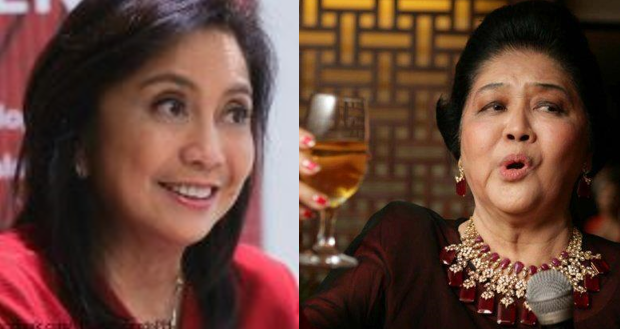 Robredo stressed that Marcos's age cannot hinder her in partying and may not prevent her from not being imprisoned. Malacañang on Sunday said it would be "premature" to speculate on whether President Rodrigo Duterte will grant a pardon to former first lady Imelda Marcos, but said that recommendations of the concerned agency will be considered. Duterte had favored burying Ferdinand Marcos in the Libingan ng mga Bayani—and the dictator was subsequently installed in the heroes' cemetery in unannounced rites in November 2016. 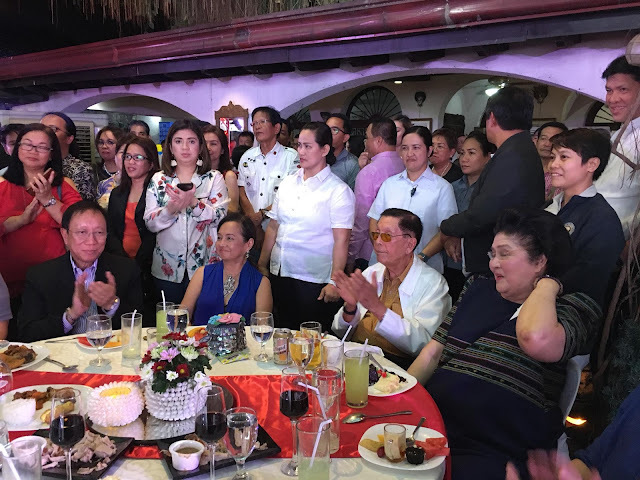 In August this year, Ilocos Norte Governor Imee Marcos' party Ilocano Timpuyog signed a coalition agreement with Davao City Mayor Sara Duterte Carpio's regional party Hugpong ng Pagbabago. The President also declared that he would step down if Bongbong Marcos were the one to replace him, not Vice President Leni Robredo.